I anxiously look out from the passenger seat of the white Tata Indica cab as it tries to meander through the semi-blocked narrow strip of the road. Jai, my guide, chips in once again; he has been talking all morning, “it’s the landslide season ma’am”. 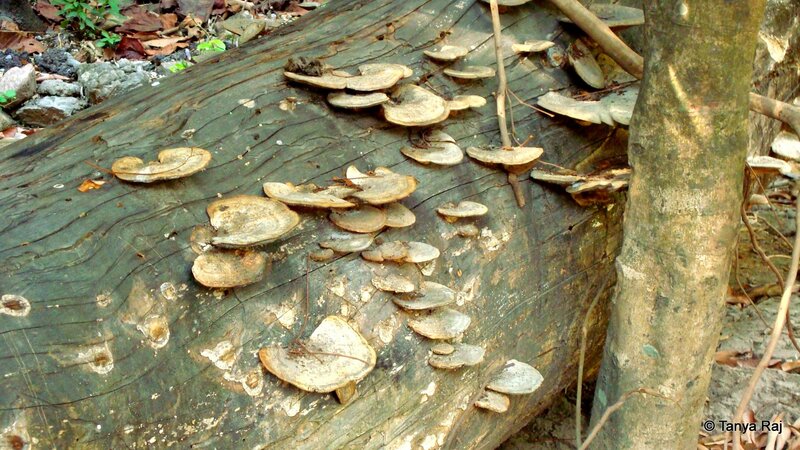 Tree trunks covered in mushroom outgrowths, lie on the narrow path to the cave. I humour him, “yes, that must be it,” climb out of the car and stretch my limbs. The cemented entrance door is painted a pale yellow and the words Vashishta Gufa Ashram is written in bright red paint. 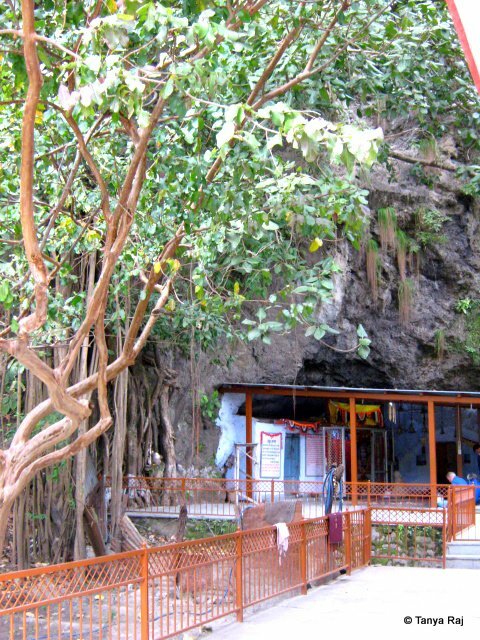 This is a cave shrine where Vashishta Muni (sage) is said to have spent time meditating in the foothills of this Himalayan town. Vashishta is one of the seven Saptarishis (seven great sages) and one of the nine Prajapatis (lord of the creatures). The Big Dipper constellation of the Ursa Major denotes the Saptarishis in the Vedic astrology system and the star Mizar is known to denote Sage Vashishta. The sage is also attributed with being the chief author of the Mandala 7 in Rigveda. Ariel roots of the banyan tree covers the cave from the outside. Some 100 odd steps along the large boulders lead us down to a narrow path leading up to the cave. The path of both sides is lined with an iron railing painted in bright vermillion paint. A small iron gate brings us to an open courtyard with an asbestos canopy standing on thin iron pillars. 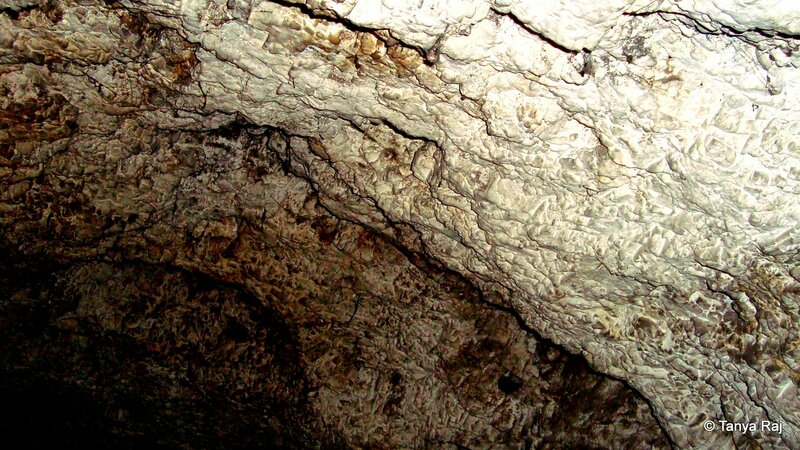 In front of me stands the rock face of the cave with a discreet entrance cut into the rock. On my right, huge banyan trees sprout their gigantic limbs across and over the canopy. 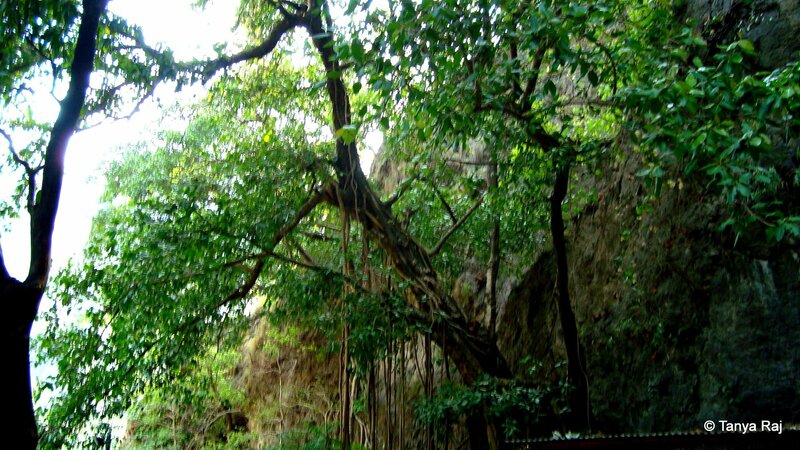 The aerial roots snake down from the branches, covering the cave exterior and giving it a mystical appearance. On the left, the vista starts with white sands, interspersed with smooth colourful rocks of various shapes and sizes and finally the pale jade waters of River Ganges that flows calmly making gushing sounds over rocks lying at its shallow bed. The courtyard at the cave’s entrance, where the sage is said to have spent his time meditating. Tearing my eyes away from the magnificent view of the sand, pebbles, water and the mountains against a blue sky with long streaks of cirrus clouds, I cross the small courtyard towards the small cave entrance. I bend a little and find myself surrounded by grey perforated walls of the cave. The air is cool and damp and it is pitch dark ahead. I take the support of the rough looking walls, which are interestingly quite smooth to touch and inch my way towards the inner chamber. My feet bump into something and I hear a groan. With no visibility, I utter a “sorry” to the space towards my right, hoping it was a person I just kicked. At the mouth of the cave, before plunging into the darkness. The air was dank and chilly inside. 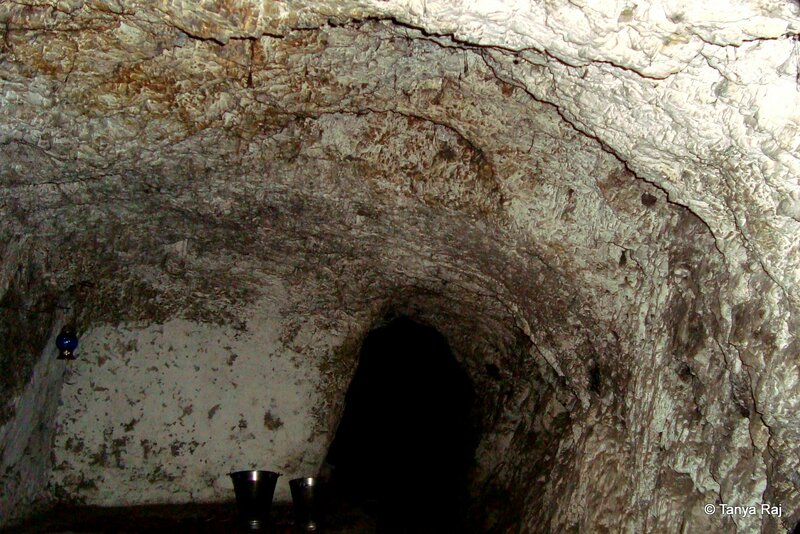 The perforated walls of the cave were ice cold but provided the much-needed support in the darkness. About 25 meters ahead of me I see a small light flickering in the darkness. Big enough to point me in the right direction but not to light the way. I follow the light, literally. Inching my way into the damp dark cave, I feel the cave walls for direction when Jai offers his hand to lead the way; clearly, he is a pro here and has no difficulty in finding his footing. Finally, we come to a small landing where the cave opens just a little, enough for people to gather up and sit around the flame that has been my guiding light. 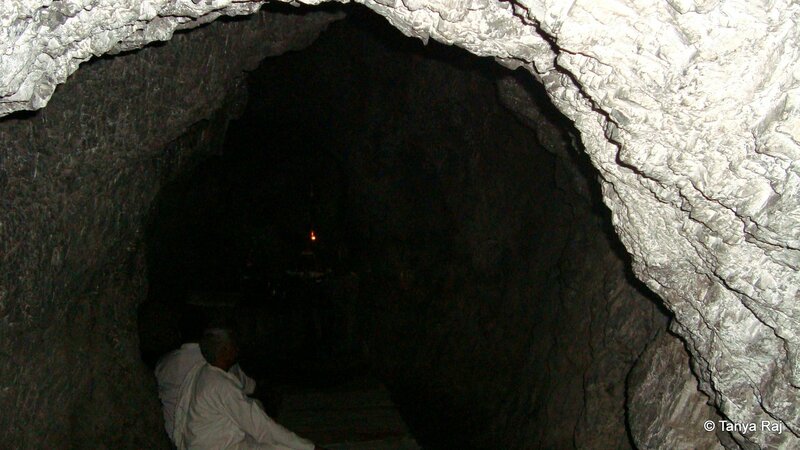 The flame is lit up on a small stone that abuts the end of the cave and holds a small Shivling. It is decorated with bel leaves and yellow marigolds. People on the floor sit deep in meditation, with only occasional coughs that can be heard. The silence is soul-stirring. I find a spot and join in the peace and calm. The lone light from the lamp in the womb of the cave, where people gathered to sit in meditation. After about thirty minutes we make our way back out of the cave and into the courtyard. After a small climb-down from the courtyard onto a dirt track, I follow the gushing sound of River Ganga towards the secluded beach. 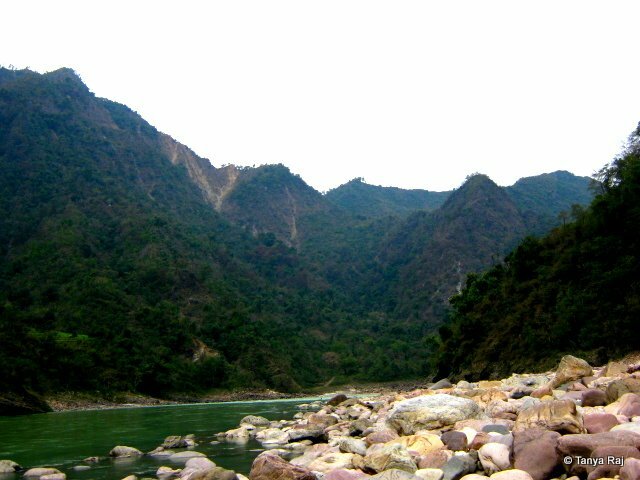 Smooth boulders and pebbles cover the initial stretch of the land followed by white sand and finally the crystal-clear waters of Ganga. In the distance intersecting mountain peaks stand tall. 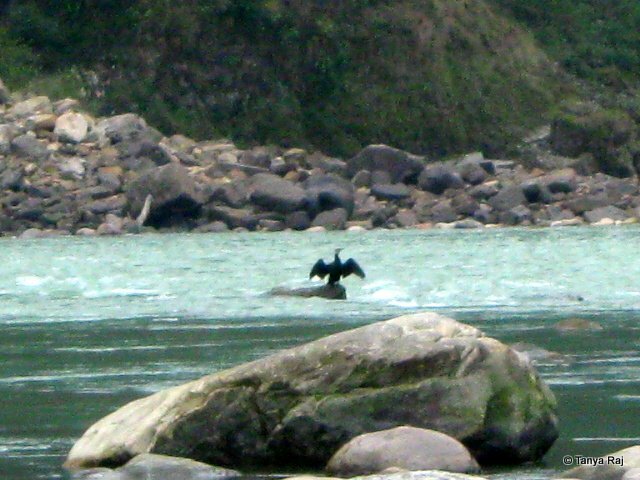 The water cuts through the rocks jutting out of the river bed and birds stand on them, spreading their wings, taking a bath. I pull a blanket from the backpack and spread out on the sand to sit for a while. 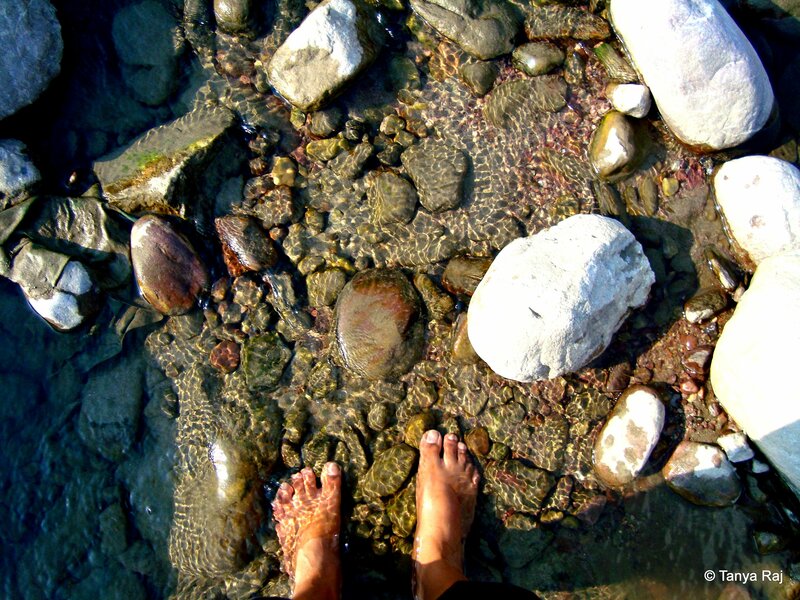 This place is one of the most secluded and peaceful sanctuaries I have found in Rishikesh and provides a place for quiet contemplation and reflection. Pebbled area of the riverside, outside the cave. Water flowing here is amazingly clear. River and mountains, the best medicine. A bird takes its bath. 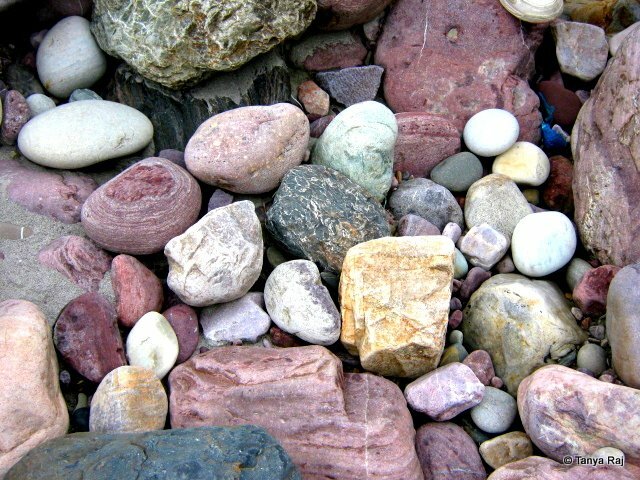 Colourful stones at the riverside. I swear by Divine Ganga Cottage at Laxman Jhula. The owner Vivek Nanda is very helpful and so is the staff, who even get up at midnight to check you in and prepare a meal! This area is less touristy and less crowded than Ram Jhula and still a walkable distance to Parmarth Niketan for the evening Ganga Aarti. There are good places for meals around. Try the German Bakery for breakfast. 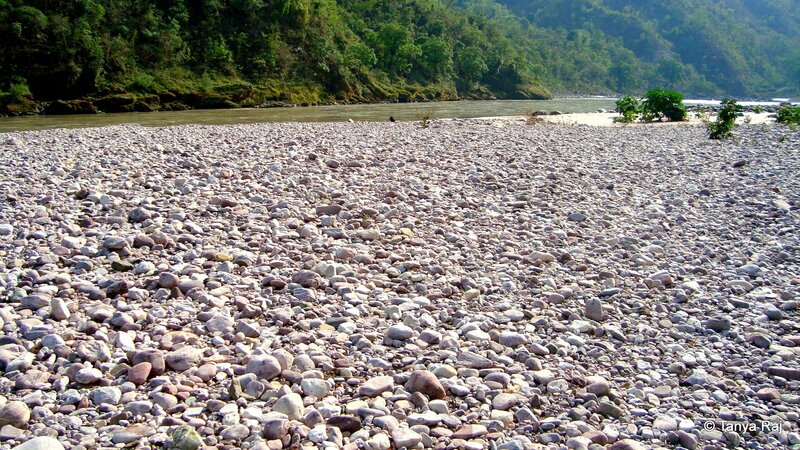 Vashishta Gufa is ~18 kilometres away from Rishikesh and can be reached by hiring a taxi. My recommendation is Vijay (Jai) from Holy Ganga Travel Company. such a beautiful place..love the shot of the mushrooms on the tree trunk!